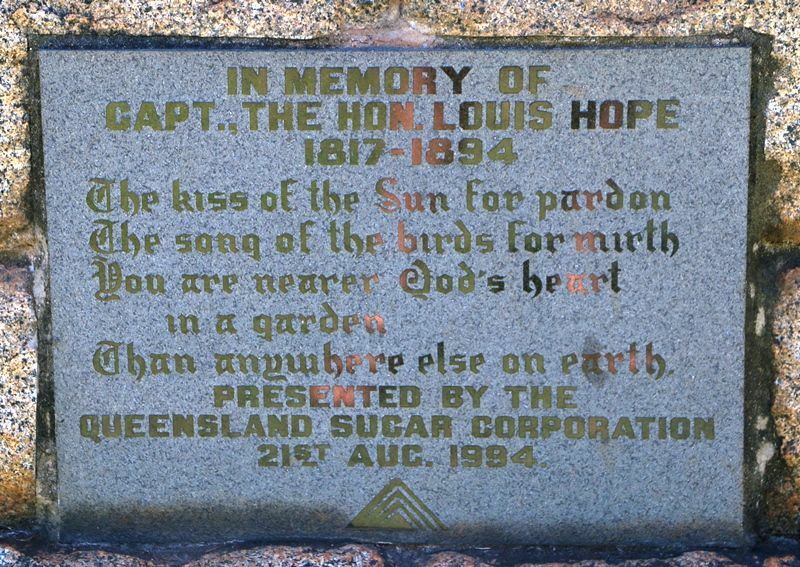 A plaque at the base of sugar cairn commemorates the centenary of the death of Louis Hope (1817-1894), grazier, sugar planter and miller. In 1853 at Ormiston Louis Hope took up land surveyed by James Burnett and with Robert Ramsay as partner bought Kilcoy station which became entirely his in 1863. He served in the Queensland Legislative Council in 1862-82. At Ormiston he became a major figure in establishing the colony's sugar industry. Some twenty acres (8 ha) were put under sugar cultivation with Kanaka labour from 1865 onwards. He had a mill built and in 1864 produced three tons (3.04 tonnes) of sugar and fifteen cwt (762kg) of molasses. He supplied plants for the several experiments of John Buhôt and cuttings for plantations in the Oxley district. He earned the title of “The Father of the Commercial Sugar Industry” not only for growing and milling the first commercially produced sugar, but for his sterling efforts to foster the industry in Queensland.